Crowds cheer as Pope Francis arrives at Kololo airstrip in Kampala, Uganda, Nov. 28, 2015. Pope Francis urged the throng of Ugandans who gathered to hear him celebrate Mass on Saturday to serve the elderly, the poor and the abandoned as a way of honoring the legacy of 45 Christians burned to death by a local king in the 1800s for refusing to renounce their faith. 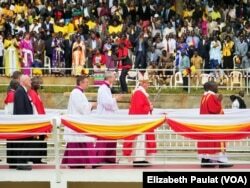 At the Martyrs' Shrine in Namugongo, where 300,000 people gathered to hear him preach, Francis encouraged the crowd to be missionaries at home and carry their faith within their daily lives. “This legacy is not served by an occasional remembrance or by being enshrined in a museum as a precious jewel," he said. "Rather, we honor them, and all the saints, when we carry on their witness to Christ, in our homes and neighborhoods, in our workplaces and civil society, whether we never leave our homes or we go to the farthest corner of the world." Pope Francis walks across a bridge toward the pulpit to celebrate Mass, in Namugongo, Uganda, Nov. 28, 2015. On the second day of his visit to Uganda, Pope Francis kept a busy schedule, focused on the young, the elderly and the poor. After celebrating Mass, he traveled to an unused airstrip in Kampala to receive an enthusiastic welcome from about 150,000 young people. There, he heard from a young girl turned activist who was born HIV-positive and a man who was abducted by the Lord’s Resistance Army before escaping and later receiving a university degree. Francis told the young people that faith can help them overcome all of life’s difficulties. 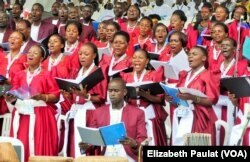 The choir mixed Catholic hymns with traditional Ugandan songs throughout the event, in Namugongo, Uganda, Nov. 28, 2015. Susan Labwot, a lawyer attending the rally, said that message is important for the youth of her country. “And so it is a very good example that the pope has come to the country in such a critical point in time, so that the youth are encouraged, the youth are given more faith, they are given some sense of guidance and mentorship from the Holy Father,” Labwot said. Many of the young people in attendance hoped to learn from the pontiff, like Tom Asaba, 23. “We have a lot to learn from him, especially in the world of temptation," Asaba said. "The youth are having a lot of temptations today." Words of hope from Francis can be transformational for Ugandan youth, he added. Young Ugandans, who make up 70 percent of the country's population, face many issues, including widespread unemployment. The church already has successful programs that tackle youth unemployment, Asaba said. "Each year they at least come up with several programs that engage the youth, especially for various job opportunities,” he said. Anthony Kabaka, a young Catholic priest, said he thought the church could help the government improve conditions for young people. “If the government and the church draw a strategy to help these youth, the church can really get involved to bring closer those services to the youth and also educate them on the morals," he said. The changing climate and the role humans play in that change was also a matter of concern to some of the youth in attendance, and they said they thought the Catholic Church could offer ways to change, said Isaac Kabongo of the Ecological Christian Organization. “The pope must call on all Christians to protect the environment, and a response on climate change is what we’re really interested in,” he said. Francis told the young people that if they wanted to see change in their environment, they needed to take it up themselves with the power of Christ. Many Ugandans, like Benard Otonga, hoped the pope's message of peace and reconciliation would carry into the new year, as the country prepares for a presidential election. Pope Francis drove a loop around the main stage, greeting fans on all sides, before celebrating Mass in Namugongo, Uganda, Nov. 28, 2015. “Early next year, we’re holding elections. We believe the pope is going to pray for a peaceful election in this country," Otonga said. The pope continued his full schedule Saturday by meeting with sick, elderly and disabled people at a charitable home, as well as with Catholic bishops and priests, seminarians, and other religious men and women. Pope Francis began his first African tour on Wednesday in Nairobi. He arrived Sunday in the Central African Republic where people are expressing hope his visit will mark a turnaround point for a nation that for years has been torn by a conflict between Christian and Muslim militants. 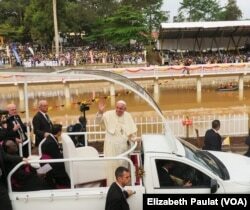 Ahead of his arrival, President Catherine Samba-Panza said Saturday people see Pope Francis as a messenger of peace. "Many Central Africans hope that the messages he will deliver will inspire a national mobilization and realization that Central Africans learn to accept each other again, learn to live together again and learn to go toward peace and reconstruction of their country," she said. The CAR has endured nearly three years of violence since a mostly Muslim rebel group, the Seleka, overthrew President Francois Bozize in March of 2013. Killings by the Seleka triggered the rise of mainly Christian militias known as the anti-Balaka. Pope Francis is scheduled to meet with Samba-Panza, whose interim government mandate expires in January, as well as visit a refugee camp and hold Mass. VOA's Serghino Roosblad contributed to this report from Kampala.